YESSS: Okay, I'll redirect our newest pop-up to OhMyDisney.com. VANELLOPE: Jeez Louise, this place is bonkers! Whoa! VANELLOPE: Oh, I mean, no offense or anything. Well, time to get to work. ANNOUNCER: And for your final question. "My friends would describe me as?" GIRL USER: Smart, funny, kind, or brave. Um...Kind, I guess? ANNOUNCER: Based on your answers, your princess BFF is Snow White! SNOW WHITE: I do believe our friendship will be the fairest of them all! VANELLOPE: Hey, wanna meet my BFF? It's Wreck-It Ralph. Just click here to see his new video. MAN USER 1: Yeah, um, in Captain America: The First Avenger...Red Skull refers to Yggdrasil, the World Tree, Guardian of Wisdom and Fate. Are we to believe, sir, that you are a descendant of that tree? MALE USER 1: Okay, okay. Thank you very much. FEMALE USER: Um, what is Drax really like? MALE USER 2: Yeah. Are you a conifer or a fruit-bearing tree? VANELLOPE: I... Excuse me. I'll take this one. He is Groot, I am Vanellope, click here to meet Wreck-It Ralph. Eh, this is almost too easy. STORMTROOPER 1: Hey, do you have a permit for that pop-up? STORMTROOPER 1: That's unauthorized clickbait. You're coming with us, kid. STORMTROOPER 2: She's getting away. GRUMPY: Hey, can't you read? Cast members only! STORMTROOPER 2: I think she went down this way. Come on. STORMTROOPER 3: Did you see a kid come through here? GRUMPY: She came running through here like a headless hen. STORMTROOPER 3: Any sign of her? STORMTROOPER 2: No, maybe she went down to the Air Bud pavilion. STORMTROOPER 3: Come on. Let's check it out. VANELLOPE: Whoa, whoa. Ladies, I can explain. See, I'm a princess, too. POCAHONTAS: Huh. What kind of a princess are you? ARIEL: Then I have to assume you made a deal with an underwater sea witch where she took your voice in exchange for a pair of human legs? SNOW WHITE: (SING-SONG) Have you ever had True Love's Kiss? RAPUNZEL: And now for the million-dollar question. Do people assume all your problems got solved because a big strong man showed up? ALL: She is a princess! ARIEL: Ooh! I want one, too, you guys! CINDERELLA: I'll get my mice on this. (SIGHS) So this is love. All hail Princess Vanellope, the queen of comfy! VANELLOPE: Whoa, whoa, whoa, whoa. Wait! What's going on? VANELLOPE: Yeah, but there was like music and a spotlight. Wait, you all saw it too, right? VANELLOPE: Oh, that's never happened to me. I mean, not even once. BELLE: Well, there is a lot to unpack here. BELLE: So, this steering wheel you sing of, that's a metaphor? VANELLOPE: Oh, no, no, no, it's not a metaphor. I just... I literally want a steering wheel. I think the issue is I was a little pitchy. MULAN: Maybe a little. But sometimes your song can't start until you go someplace to reflect. SNOW WHITE: Oh, yes, I like to stare at a wishing well! VANELLOPE: Right. Of course. "Important water." I stare at the important water and somehow magically I'll start singing about my dream? 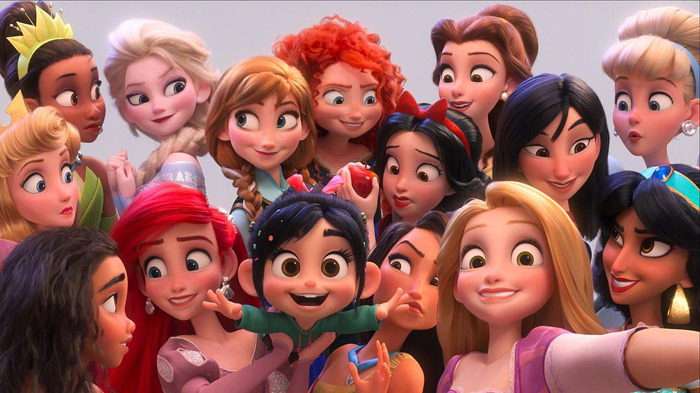 VANELLOPE: Uh, yeah, I don't think so, ladies, but thanks. VANELLOPE: Uh-huh. (WHISPERING) What did she just say? So nice of you sharing this material.